As we celebrate the milestones increasingly achieved for equal marriage across this country, it’s important to remember that in thirty-seven states — as well as at the federal level -- trans folks don’t have the assurance of basic civil rights. And in one state, Maryland, recently gained protections are under threat. We still have a long way to go. That ongoing and upcoming journey reminds me of the first reading we heard this past Sunday, June 8th, which was from Genesis 12:1-9. In it God tells Abram — the forbearer whose name and identity God would change —“Go from your country and your kindred and your father’s house to the land that I will show you. I will make of you a great nation, and I will bless you, and make your name great, so that you will be a blessing.” Abram and Sarai made their way to the land that God promised to them, and when God pointed out that land to them, they stopped and built an altar to God. As they made their way through this land, in fact, they stopped at several points, marking the stages of their progress with altars. 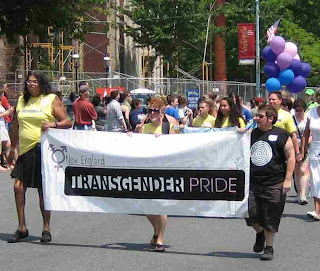 In a way, that’s what this New England Transgender Pride was doing — it was a day to stop, assess where we have been, to take pride in who we are, in how far we have come, and to strengthen ourselves for the various stages of the journey ahead. And it was a day to claim the promise — the promise that our unique human dignity will be honored and that this very humanity will take its place — is even now taking its place — amid all the interweaving strands of creation’s tapestry, as a blessing. Now how many of you fabulous allies out there might have hopped into a trans pride parade wearing an Episcopal Church Welcomes You rainbow tank?! These questions challenge those who view gender as infinitely refracted as much as those who would define it in strictly dualistic terms. In a sense, we have on our hands a twenty-first century version of the one and the many. To float an answer to the question about self-fragmentation (with its fascinating link between queerness and Protestantism), I believe that as we name and embody our differences with ever-greater precision we will fragment to the extent that we base our alliances mainly on the degree of our similarity. But what happens when our bonds are based not only upon similarity of experience or embodiment – “who we are” -- but also upon principle, which, for Christians, would be the good news? Upon the radicality of God’s dream in which all -- all for real, not all ‘whose manner of life’ doesn’t ‘pose a challenge’ to me – are not only welcomed but expected, listened-to, even delighted-in, and ultimately drawn into God’s ongoing project of creation? As we already know, the stages of our passage will be marked with struggle, and sometimes by fragmentation. At points we, like Abram and Sarai, will need to pause and mark with gratitude how far we’ve come, and then continue on. If ours is a mission bent on love, the journey will bring us – all of us – home. And in this process, somehow, we will all become a blessing to one another.